An attractive bouquet of premium flowers makes for a wonderful gift, in most cases. There are, however, times when flowers just aren’t an option, or they simply aren’t the right option. 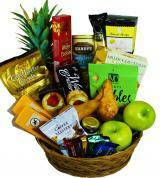 When a special occasion arises and you need something other than flowers to send, fruit basket gifts are a great choice. At Avas Flowers, we offer our customers more than just flowers and flower delivery. We also offer a selection of other desirable gifts such as delicious fruit arrangements. Delivery options, including same or next day delivery, are available depending on the basket chosen and the delivery area. 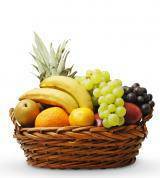 In order to have fruit baskets delivered to certain areas, a 24-hour notice may be required. 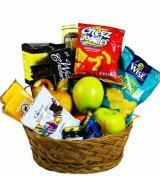 There are plenty of occasions when our online customers visit our site to place a gift basket order. 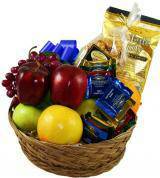 Fruit basket gifts contain only the freshest fruits that are in season and unblemished. Our baskets are brimming with colorful fruit such as apples, pineapples, bananas, and oranges, which should be kept properly to extend their freshness. You can also send fruit basket arrangements that are combined with other edible items that are sure to be a treat to whoever receives the gift. Although they may vary upon occasion, you can at various times buy gourmet fruit and candy baskets, baskets that are filled with fruit and various cheeses and/or crackers, cookies, etc. 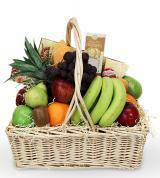 Fruit baskets that are combined with our premium flowers are also an option that you can send to loved ones. You can have fruit baskets delivered to a friend who may be stuck at home with a cold or the flu or to friends who are recovering in the hospital. When sending to a hospital, verify that the hospital and your friend can receive such a gift. Fruit-filled gift baskets are also a nice gift for new parents to enjoy. They also make good gifts for people who are moving into a new home, when someone receives a promotion, or at any time congratulations are in order. 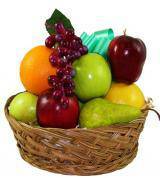 A fruit basket even makes an appropriate gift for one’s business clients or associates. At Avas Flowers, we have established relationships with flower shops and florists across the country, which allows us to better serve our customers. As a result, you can schedule any of our fruit arrangements for delivery to most places nationwide. Once you’ve made your purchase, you can check your order and the status of your delivery right from our website. As a part of our desire and commitment to providing excellent service to our customers, we make every effort to answer questions that you might have. For answers to your questions, first check our FAQ page for some of the more common questions asked by new customers. If you have a more specific question or can’t find the answer that you are looking for, contact us by phone or email. You’ll find that whether you’re buying fruit baskets or flowers, Ava Flowers is the place to shop.